Adjoining Alum Chine, Warren Road is very short and, combining with Drury Road, makes a crescent. At the junction, there is foot access to the Chine. The houses are substantial villas – mainly now converted to flats. They are all on the north side. The first four houses would appear to have originally been identical. However, two have been rendered, and all have slightly different porches on the front. Further down towards the Chine, the houses are slightly larger, perhaps suggesting that being nearer the Chine was a better location for the more well-off. The origins of the road name are unclear. It appears as Warren Path in a plan of 1871 (one of the boundaries of the Denewood estate). It is part of the ancient trackway that emerged from Alum Chine used by the copperas workers and before. Warren if, of course, related to rabbits. It is also a name associated with game birds and animals too. Although there is no direct evidence, it is not beyond the realms of possibility that the Denewood Estate employed gamekeepers, or “warreners”, and that the original path inherited its name from them. Coy Pond in Branksome was so named because it was used for duck decoying purposes around the Bourne. 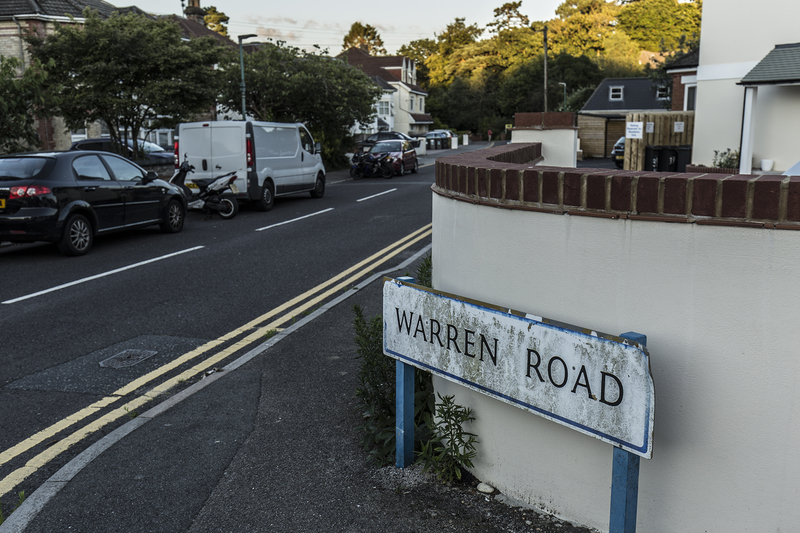 This again suggests a possible link to the ultimate naming of Warren Road, but again, there is no real evidence for this. I am indebted to Alywn Ladell for his input on this subject. If anyone else has any other thoughts, or some positive evidence which might clarify where the name came from, then please let me know!